The normal lens inside the eye focuses light rays. This lens has a cellophanelike outer lining called the capsule, and inner layers called the cortex and the nucleus. Normally, the lens is clear. When it becomes cloudy and interferes with vision, it is called a cataract, and the treatment is to remove it surgically. The posterior capsule (located behind the implanted intraocular lens) can become cloudy, causing some loss of vision. This is not uncommon and can develop weeks, months, or even years following cataract surgery. Posterior capsulotomy is a laser treatment commonly known as a YAG Laser Treatment. 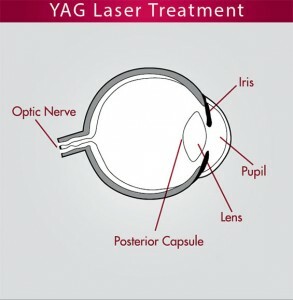 The YAG Laser Treatment is sometimes necessary to clear vision after cataract surgery. The YAG Laser Treatment (a carefully aimed beam of light) creates a tiny opening, allowing light to enter the eye. This treatment usually results in an immediate and dramatic change in vision. The earlier you and your doctor decide that this laser treatment will benefit you, the better your chance for restoring the clarity of your vision. The need for a capsulotomy should not cause undue concern since the clouding or wrinkling is part of the body’s normal healing process in a certain percentage of patients. Since Medicare Insurance does not include YAG Laser Treatment in the price of your cataract surgery, we will bill your insurance carrier separately for this procedure when it is performed.